Hawaiian culture has its own traditions and meanings behind those traditions. Weddings are no exception to this; Hawaiian weddings have specific customs, many of which can be incorporated into contemporary wedding ceremonies. The Knot.com reports that traditional Hawaiian wedding dresses are white and in the shape of a loose, straight gown, similar to a muumuu. However, the form of the dress is not intended to make the bride look shapeless, but rather to reflect the flow of the breezes on and waves surrounding the islands. The dress is often sleeveless or has off-shoulder sleeves. Traditionally, a bride wears a headband of small white or pink flowers with some greenery. According to The Knot.com, the colors are designed to complement the bride's white attire and reflect the islands' floral abundance. In a traditional Hawaiian wedding, The Knot.com reports, a groom also wears white in the form of a white shirt and slacks. Neither is closely fitted, again to reflect the breezes and waves of the islands. However, Royal Kona reports that tradition dictates that he wear a brightly colored sash around his waist. Many times, this sash is red or orange. 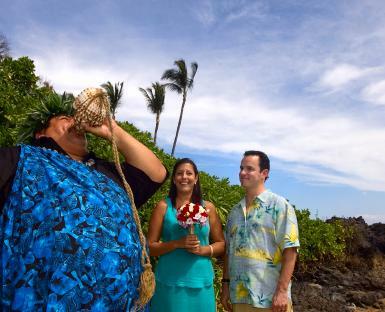 According to BorrowedandBlue.com, Hawaiian weddings are officiated by a holy man, known as a Kahu. In modern times, this person may or may not be a minister, but has the power to perform the wedding ceremony. In a traditional Hawaiian ceremony, reports The Knot.com, guests are greeted by and seated to the music of a ukulele. Royal Kona states that the groom is allowed to mingle with guests prior to the ceremony. The altar is decorated with a circle of flower petals, to represent a circle of love. The couple stands in this circle as they exchange vows, rings, and leis. First, the Kahu blows into a conch shell, called a pu, to create a horn sound. BorrowedandBlue.com reports that this sound calls the bride to the ceremony and is intended to draw the air, land, fire, and sea to witness the union. It also indicates that something special is about to happen. The groom waits at the altar for the bride but faces away from her. As she begins her walk, he turns towards her. The bride walks down the aisle alone. The bride and groom then exchange leis, followed by the ukulele player playing the Hawaiian Wedding Song, which is interpreted by hula dancers. This song was written in traditional Hawaiian in 1926 for an operetta titled Prince of Hawaii. It was translated into English in 1958 and renamed "Waiting for Thee". Following the song, the Kahu helps the couple through their vows. MyWedding.com states that prior to the exchange of rings the Kahu dips a koa wooden bowl into seawater. Koa wood represents strength and integrity. The Kahu then dips a ti leaf into the water to represent prosperity and health before sprinkling the rings three times with the water and reciting a traditional chant. Next, the couple pours two different colored sands into a container. This symbolizes the inability to sever the union created during the ceremony. Before the end of the ceremony, MyWedding.com reports, the couple wraps a lava rock in the ti leaf used in the ring ceremony. This is done to commemorate the couple's union. Finally, the Kahu also blows the pu at the end of the ceremony, to signal the closing of the special ceremony. The Knot.com also reports that the lei, a flower garland, makes an appearance in almost every traditional Hawaiian wedding. A lei symbolizes respect, love, and welcome. The bride's lei is often made of pink and white small flowers, while the groom's consists of large green leaves woven with white flowers. 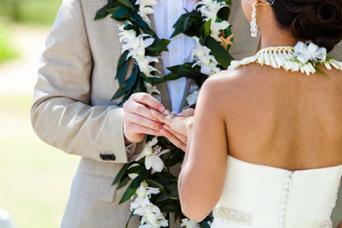 It is tradition for brides and grooms to exchange leis during the ceremony. They may do so by switching leis or having a flower girl hand the leis to them to gift each other during the ceremony. The exchange of leis represents the couple's eternal love. The couple usually also gives leis to their parents, and their parents give leis to the couple. This represents affection and welcome to all family members. Traditional Hawaiian wedding receptions did not involve any specific food or entertainment, such as a luau. However, planning a meal that showcases the islands' abundant fruits, pork, and fish pays homage to the islands' culture. There is no uniformity in traditions among contemporary Hawaiian wedding celebrations. Many couples, including those traveling to the islands for a destination wedding, pick and choose which traditional elements to include in their ceremony. Most common are the inclusion of the groom's attire and pouring of the sands. The former is used for comfort, while the latter reflects the non-severability of the union. Leis are also used in both contemporary and historic weddings. If you are planning a destination wedding on a Hawaiian island or want to showcase your Hawaiian heritage during your wedding ceremony, including traditional elements can add some Hawaiian culture to your nuptials. Choose those elements that work for you and which have a meaning you appreciate.